When people hear “Eastern North Carolina,” one of the first things that may come to mind is BBQ. And while its namesake BBQ is certainly tangy and flavorful, the future of work and economic opportunity in this area is also heating up. For example, Greenville has a robust medical community, in large part due to the Brody School of Medicine at East Carolina University. The Brody School produces a notable 20 percent of all doctors practicing in North Carolina. And in Wilson, the city’s Gigabit internet is the first of its kind in the country and one of the fastest high-speed wifi connections in the world. It’s used to support Wilson’s businesses, college campuses and more — and residents and visitors don’t complain about a strong streaming signal either. Wilson is a regional infrastructure provider, and in many ways, is the gateway to Eastern North Carolina. The physical growth of Eastern North Carolina is evidence of the area’s economic progress. Since 2005, the population of Eastern North Carolina has grown at a faster rate than that of the United States (as a percentage of the population), adding an average of 15,000 residents each year. The U.S. Department of Transportation also recently approved a $147 million federal highway grant to widen Interstate 95 in the Fayetteville and Lumberton areas. While the small town feel of many of these cities remains intact, don’t be fooled into thinking that big things aren’t underway. America’s first English settlers made a home for themselves in Eastern North Carolina. Sir Walter Raleigh led a group of settlers to Roanoke Island to live before they mysteriously disappeared in an infamous case that’s come to be known as the Lost Colony. The group was the first of many to experience the fertile soil, lush agriculture and beauty of the area. Eastern North Carolina’s landscape gave way to prosperous agricultural industries like cotton farming, logging and tobacco. Agricultural commerce is still threaded throughout the economic fabric of the region, but other businesses and industries are making marks all their own too. Over the past 400-plus years since the Lost Colony, in addition to agriculture, Eastern North Carolina has become known for its marine trades, tourism, advanced manufacturing and the life sciences. It’s also known for its defense sector, with military bases in both Jacksonville and Fayetteville. Eastern North Carolina has one of the largest veteran populations in the nation, and companies like Bunker Labs are seizing the opportunity to help foster a generation of business people from this community. Roberts explained that many veterans settle in the areas around their military bases once their service is complete. He said that veterans make good entrepreneurs because they are disciplined and focused. He recently did an entrepreneur development seminar in Wilson, which is helping lead the charge for many Eastern North Carolina communities to redefine their economic future. Once a predominantly agriculturally focused community, Wilson is slowly but steadily becoming a thriving hub for entrepreneurship, technology and even foodie culture. Roberts said smaller city markets are often “ignored” by the rest of the state and places like Wilson are sometimes thought of by the general public as “great places to visit” but alluded that people fail to realize the untapped potential of smaller cities. Peak Demand Inc. is a global manufacturer of electrical transmission and distribution components. Rennie said he wanted his company to be located near the East Coast, and after visiting several communities and build sites, he kept coming back to Wilson. He said access to I-95 and proximity to the water for importing and exporting products helped solidify his decision. Rennie said that building a business in the region that represents growth and technology has been very well received. Even companies that aren’t located in the heart of Eastern North Carolina are having ripple effects in the area. DisposeRx is helping combat opioid abuse with its formulaic disposal method of unused prescription medication. While the opioid epidemic is rampant nationwide, Eastern North Carolina, in particular, has suffered. Wilmington is number one in the country for opioid abuse, with Jacksonville and Fayetteville also ranking in the top 25. Simpson, who calls himself a “small town guy,” said that there are advantages to building a business in a non-metropolitan area, particularly when it comes to a sense of community. But the future of work in Eastern North Carolina doesn’t lie entirely in large companies or high tech — for Megan Oteri, she’s made a business of going back to the basics. Oteri, whose background is in education, is the founder and CEO of Brick Scholars, a mobile STEAM lab providing educational, creative and innovative learning opportunities for people of all ages. 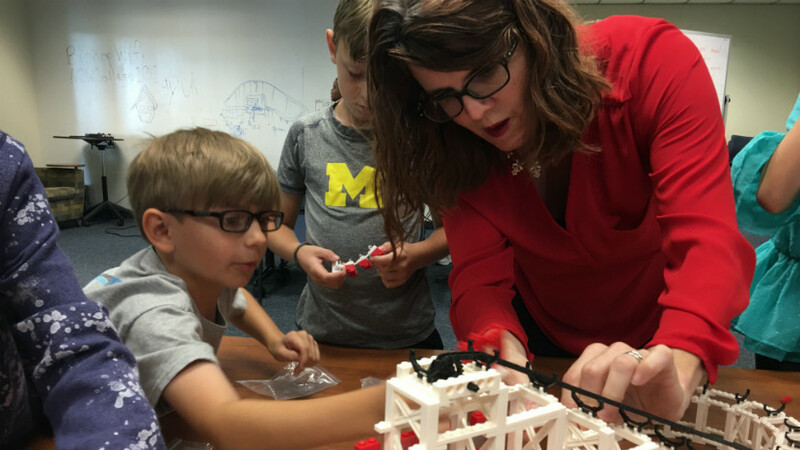 She employs the LEGO Serious Play curriculum, helping her students learn in an innovative and hands-on way with LEGO building blocks. When learning to code and immersing herself in the curriculum, she realized how much her 5-year-old son enjoyed what she was teaching him. Oteri is working hard to give people in her area valuable educational opportunities, and notes the support of the Wilson community and the Greenlight Gigabit Internet as two of the biggest advocates of her business. Speaking from the front porch of her historic house, it’s clear that Oteri has made a home and business for herself in Eastern North Carolina.